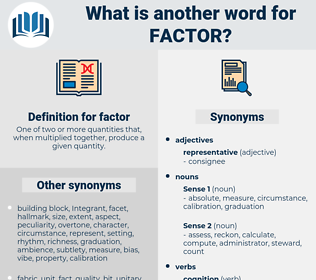 What is another word for factor? 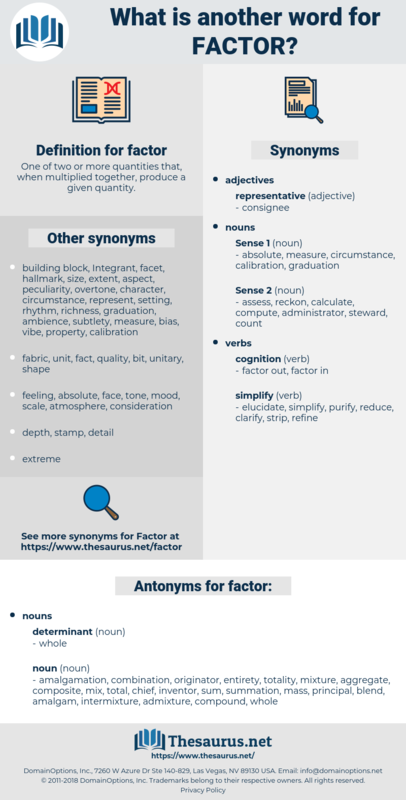 determinants, attributes, reasons, jobs, points, Areas, Qualities, drivers, Criteria, codes, skills, avenues, coefficients, element, contributor, contributors, component, components, elements. data, aspect, fact, ingredient, predictor, criterion, Criteria, reason, indicator, denominator, importance, role, contribution, enabler, parameter, source, point, thing, Postmen, element, driver, multiplier, subfactor, vector, part, contributor, significance, characteristic, force, rate, stocking, constraint, prerequisite, facet, sub-factor, catalyst, tool, requirement, condition, difference, obstacle, yardstick, component, instrument, effect, precondition, downside, contribute, phenomenon, cause, argument, index, measure, error, proportion, homing, messenger, impediment, strand, explanation, anchor, means, fuelling. incorporate, considered, Considering, integrate, reflect, contribute, accommodate, cause, calculate. amalgam, sum, total, inventor, principal, amalgamation, totality, entirety, summation, mass, mixture, chief, aggregate, mix, admixture, originator, compound, intermixture, blend, combination, composite. But in work of any creative sort, the mood, the condition of mind, is the determining factor. To be sure the chief factor of her strength was the splendid gift she possessed of using her eyes. fixture, factory, fish chowder, fox terrier, fester, figeater, fighter, foster, factor iii, faster, factor i, factor ii, fig tree. releasing hormone, fundamental, releasing factor, wild card, rf, unknown quantity, intrinsic factor, parameter. conversion factor, factor of proportionality, constant of proportionality, deflator. cipher, reckon, compute, cypher, calculate, work out, figure. bestow, impart, add, bring, contribute, lend.